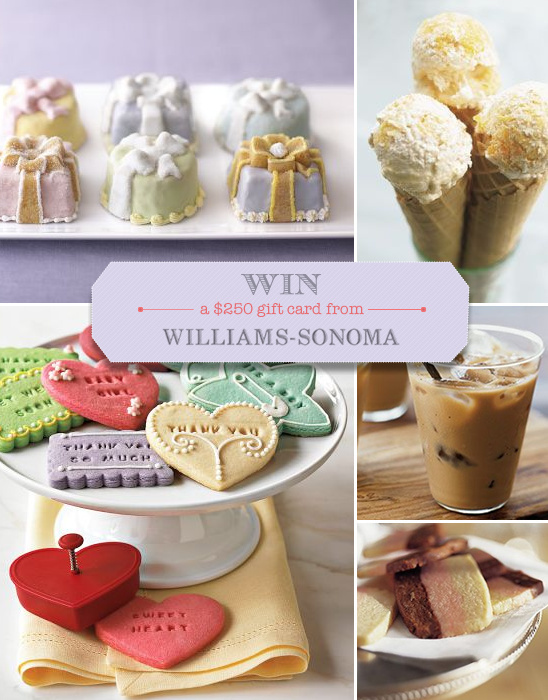 How great would it be to win a 250 gift card to Williams Sonoma? You could get all those extra goodies that you were wishing for. We know that all of you love homemade treats and Williams Sonoma pretty much has everything for the baker in you. Here are a few things that we found that you might love. First off we adore the Mini Gift Cakelet Pan, it bakes three round and three square "gift-wrapped" cakes. Below that we have the cutest cookie cutter set we have ever seen. You are able to create personalized cookies for Valentine's Day, birthdays and other occasions. Another note worthy section on Williams Sonoma's website is their extensive recipe collections, from apricot and praline ice cream to a tasty vanilla bean iced coffee. It is super easy to win. Follow the steps below to enter. Please enter as many times as you like for a better chance to win. 1. Visit your Williams-Sonoma registry online. If you need to create a new registry click here 2. Once you've logged in, add a new item to your registry. 3. Come back to The Wedding Chicks and let us know what you added to your to your registry.